Screen is a text window manager. 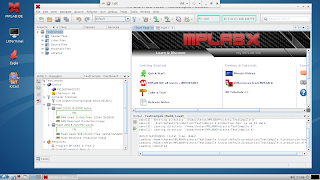 It allows you to open several virtual windows from one text console. You can easily switch between windows using keyboard commands. One of the strongest feature of screen is decoupling the virtual windows from the console. In simple terms, you can leave a program running in a virtual window and log off and then re-attach to the same session later. Here is how you do it. 4. To see a list of windows - ^a"
5. To see a list of available commands - ^a? 7. To re-attach to previous session type "screen -r". ^ means hold down control key and then type the commands. These are a few frequently used commands. A more detailed tutorial is here.